Oxxean Marine » OXXEAN Marina Committed to Nautical Tourism in Chilean Patagonia. OXXEAN Marina Committed to Nautical Tourism in Chilean Patagonia. The first private marina in the southern zone, docking headquarters and site of the last leg of the Chiloé Regatta. Last Friday, January 26, at 4:00pm, a total of 24 class J105 and S40 vessels with almost 190 participants began arriving in Puerto Montt, docking at OXXEAN Marina. They finished their participation in the Chiloé Regatta in the Puerto Montt Bay. 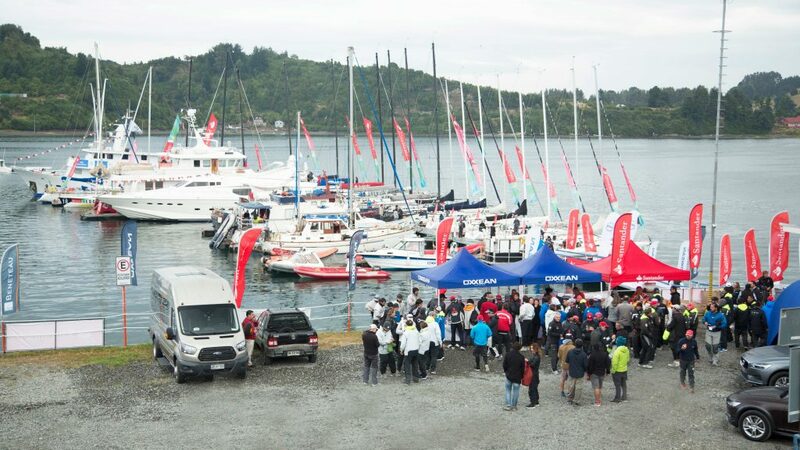 The regatta, a competition which has brought together water-sport enthusiasts since 1989, is currently the most important regatta on the national calendar, drawing national and international participants and promoting navigation in Chilean Patagonia. The Chiloé Regatta 2018 is the fifteenth version of the race, which takes place every two years in the south of Chile, and on this occasion commemorated the 200th anniversary of Chile’s Army. It is a long and demanding tournament. It covers more than 200 nautical miles (370 kilometers), in eight races, where winds and strong currents pose a challenge for participants. For the first time in the history of this regatta, female participation was honored by Empresas Oxxean, which awarded a special recognition to the crew of S40 HDI, comprised of an all-female team of 8. With this award recognizing the female participants for their strength and drive, values representative of Chilean women, Oxxean provided a platform for women, who gain more positions in the nautical world each year. OXXEAN Marina is a private marina, the only one located in the south of Chile, and has capacity to receive sailboats, yachts, and mega yachts up to 96 meters in length. It has a draft of 11.4 meters, and its engineering and anchoring structures were designed with the most adverse wind and current conditions in mind. It also features a privileged location, alongside Tenglo Island, in the channel with the same name, situated close to downtown and only 12 km from El Tepual Airport. This allows a safe connection by sea, and efficient and easy access by land, providing its clients a safe and privileged location. “For more than 3 years, we have been working jointly with the SASSYS agency (South American Super Yacht Support) and the Municipality of Puerto Montt to promote the Patagonia-Antarctica route as a tourist destination. However, it has been more than 5 years that super yachts have been docking at our pier, where we serve as a logistics port on the way to Patagonia. As a marina, we have the structural capacity to receive mega yachts, and we also have the advantage of a privileged location along this route with services to supply the fuel and provisions necessary for the voyage, as well as providing the comfort and privacy that our clients require. The Patagonia maritime route is still in its infancy; it’s a pristine destination that we must promote along with responsible environmental tourism, and for that, our strategic partner, SASSYS, plays a vital role. Our slogan, “Oxxean Marina-Puerto Montt, Gateway to Patagonia” encompasses all of this joint effort to promote this beautiful route,” says Tatiana Prambs, Manager of the Marina.